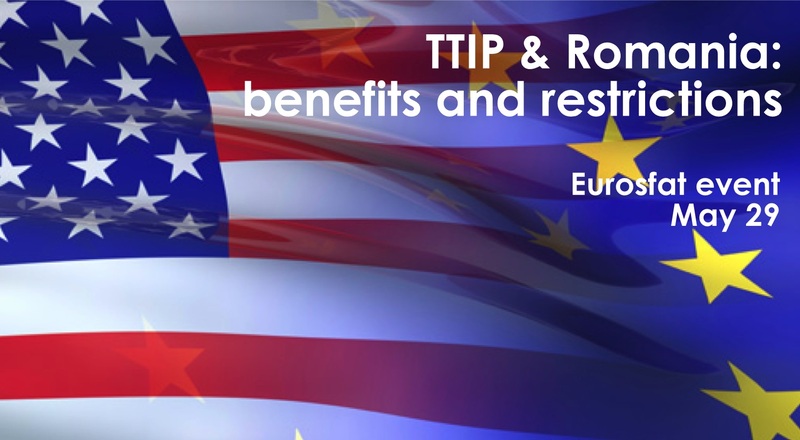 Europuls Association and Aspen Institute Romania are organizing the debate “Romania between benefits and restrictions in the TTIP framework” in the third edition of Eurosfat forum, to be held in Bucharest on May 29, 2015, at the Palace of the Parliament. The purpose of the event is to bring together politicians, activists, business representatives, researchers, experts and citizens in order to debate on key European agenda policy issues, and to help better establish the position of various Romanian stakeholders within the European Union. Among the guests who have confirmed their participation in the panel we mention Elena Bryan, Senior Trade Representative, U.S. Mission to the European Union, Sorin Moisă, MEP, S&D, Elvire Fabry, expert of the Institute Jaques Delors, Notre Europe, Lucian Cernat, Chief Economist, DG TRADE, European Commission, Mihai Bogza, President, Foreign Investors Council, Daniela Nemoianu, President of the Board of Directors, AmCham, Mircea Geoană, President, Aspen Institute Romania. Members of the government, senior officials of the European Commission, representatives of business and foreign specialists in Romanian and European affairs and international trade are expected to attend the event.